Everyone at every age needs vitamins! But I know my mom and dad don’t always love to coupon. They rely on me to get their goodies! And I love stocking them up on One A Day vitamins so I know they are always at their best! Starting Saturday at Publix, we can get (2) One A Day vitamins for FREE PLUS $1.22 in OVERAGE! YIPPEE!! Use: (1) $5/2 One A Day Vitamins 50-200 ct, One A Day TruBiotics 26-60 ct or Flintstones Vitamins 60-180 ct, exp. 6/29/19 (Publix Purple H&B Flyer) ~ Purple Coupon Starts Saturday, 6/16! Final Price: (2) FREE + $1.22 Money Maker! 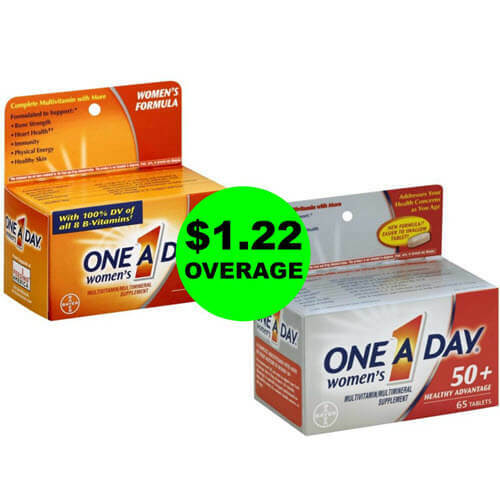 There is also a $4/1 One A Day with Nature’s Medley multivitamin (Publix Digital Coupon), $4/1 One A Day Kids OR Flintstones multivitamin product (Publix Digital Coupon), $4/1 One A Day with Nature’s Medley multivitamin Product printable, $1/1 One A Day Product printable, $4/1 One A Day Kids with Nature’s Medley, exp. 6/23/18 (SS 06/10/18), or $4/1 One A Day Men’s or Women’s with Nature’s Medley, exp. 6/23/18 (SS 06/10/18) just in case you wanted a different product. This deal ends when the sale ends Tues. 6/19 or Weds. 6/20!